This is an awesome apron we designed sometime ago but still really love. It has a curvy, sweet element with a princess neckline but super, super easy to make. Great pocket on a second skirt layer! We finally finished our 'Shop List' on our website. It took a lot longer than I thought it would but I am sure glad we went through the process. Sadly, lots of the shops are gone - but then there are plenty of new ones! We are hoping we got all the details correct. For many shops, we could not find anything about them on the internet. So we assumed they are gone. Hopefully, we did not take a shop off the list that is still in business. So if you are a shop, and don't see your shop name on our list, and want to be, let us know.We would be glad to add you! It's a great list - tons of great shops! Visit your local Quilt Shop Today! Naming our patterns has been one of our favorite things to do. Oven mitts were the most fun to name. I love the name of Keep Your Cool! (P135). Lowell's best name was Hot Stuff! (P121). 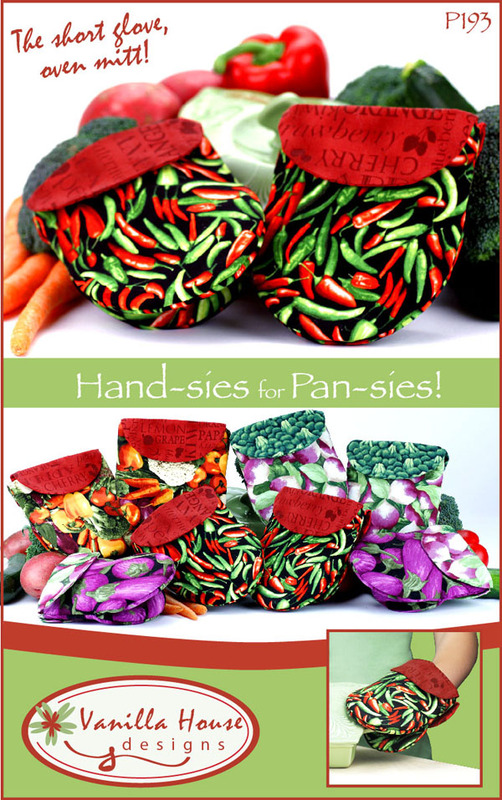 Of course, Hand-sies for Pan-sies! (P193) is probably the most clever of all. P121 Hot Stuff! oven mitt! P135 Keep Your Cool! oven mitt! 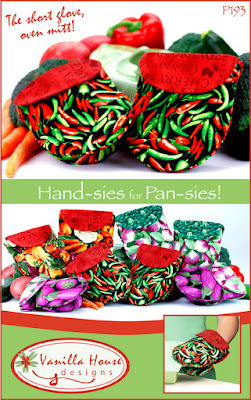 P193 Hand-sis for Pan-sies! oven mitt! Get it? Delicious Four Corners - great version of the original Four Corners! 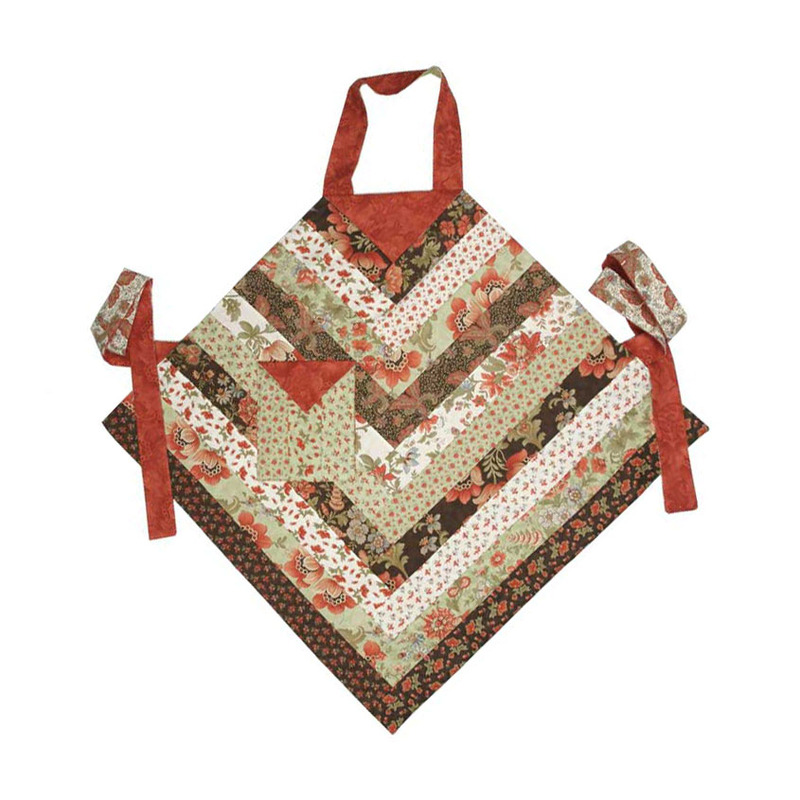 I Love the Four Corners Apron - it really is the pattern we are most famous for! 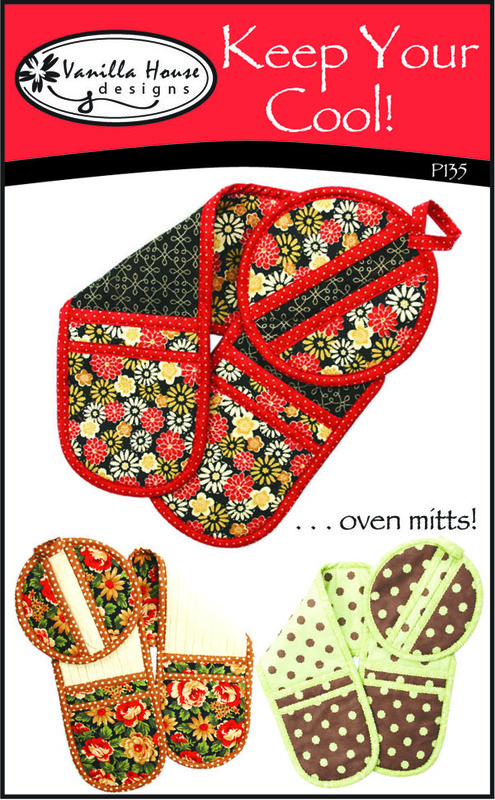 Delicious Four Corners (P143) is also very popular! Made from jelly rolls - it is really fun to make! Here's Emma wearing a T-shirt Transition. Any T-shirt, with a cotton skirt attached. P162, T-shirts Transition shows how to get cotton to accommodate a stretchy store-bought t-shirt. More information on copyright infringement! Some have asked a few more questions about copyright infringement. Are you wondering what is available to use for free? -- Apply this rule: If someone (business, individual, quilt shop, etc) is trying to sell the product, then a free version has more than likely been pirated. It is usually pretty apparent what is the original and what is a copy. I never see copies that have very much 'quality' to them. Just enough to get you to 'take it'. So take a minute and google a pattern to see if there appears to be a established 'seller'. It is usually very obvious when someone is trying to sell a product legitimately. -- How do I know when I have committed copyright infringement? -- "Copyright infringement can occur even if someone does not copy a work exactly. This example of copyright infringement is most easily apparent in music and art. Copyright infringement occurs if the infringing work is "substantially similar" to the copyrighted work." For example, one gal gave me the justification for copyright infringement. Her finished product looked identical to mine.She said she changed the name of the product (so as not to confuse it with mine) and didn't get the information from my actual pattern, instead a friend gave her the numbers to make it. Ohhhhhargh! --- no, that just does cut it! She violated copyright, plain and simple. Thanks everybody for your support and compliance. I have had wonderful and loyal customers for many years -- love you all!! 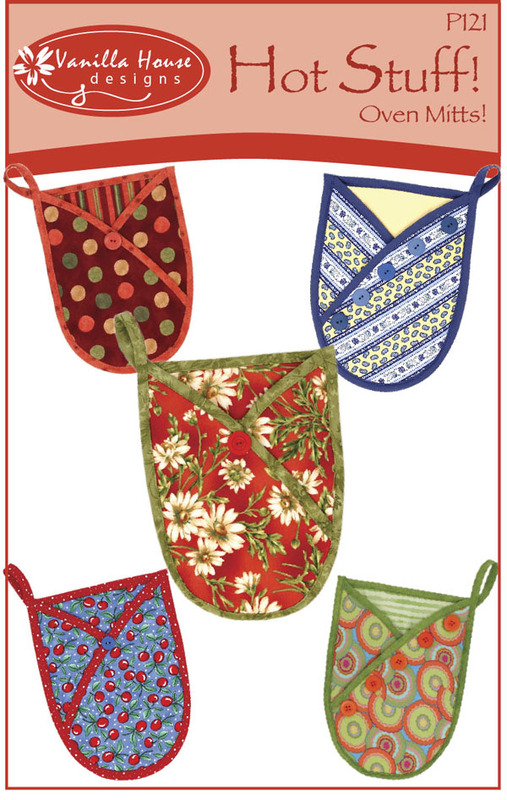 Getting ready to start new pattern designs. I have lots of things on the drafting table, but wondering if any one else has a great idea for a new pattern?